"By collecting scientific data, we aim to resume commercial whaling,"
Mother and calf Minke whales being dragged aboard a Japanese whaling ship under the surveillance of Australian customs agents in 2008. This led to a lawsuit filed by Australia in the International Court of Justice in 2010. The International Whaling Commission (IWC) was set up in 1946 to "regulate the orderly development of the whaling industry". Unfortunately it was widely perceived as failing in this task. From the 1970's onwards conservation groups began an intense international struggle aimed at saving whaling stocks from further depletion. The IWC had largely operated to ensure that whaling nations could share the whale stocks with a degree of fairness, rather than to conserve stocks for the future. It worked in a way that was more like the mining of a resource that would soon run out rather than managing a sustainable fishery. The IWC oversees whaling in the world still. Proposals put forward by Japan to take Sperm and Minke whales were criticized by the IWC because of the infeasibility of the proposed research methods. Many consider that "scientific whaling" is simply a continuation of commercial whaling under a different name. 1 - Commercial whaling - This officially ended in 1986 with the 1986/87 Antarctic season when 6,176 whales were taken worldwide. After this, the the catch limits for all commercial whaling was set to zero and officially still stands though since 1993 Norway and then Iceland from 2006 have exercised their rights to set national catch limits for coastal whaling operations for minke whales. Norway has been requested to halt this though has continued. Currently (2013), Norway and Iceland are the only two countries engaged in commercial whaling. 2 - Aboriginal or subsistence whaling - The allowance of native peoples to hunt whales as they have for hundreds or thousands of years. Most of these people live around the Arctic, with some in the Caribbean. 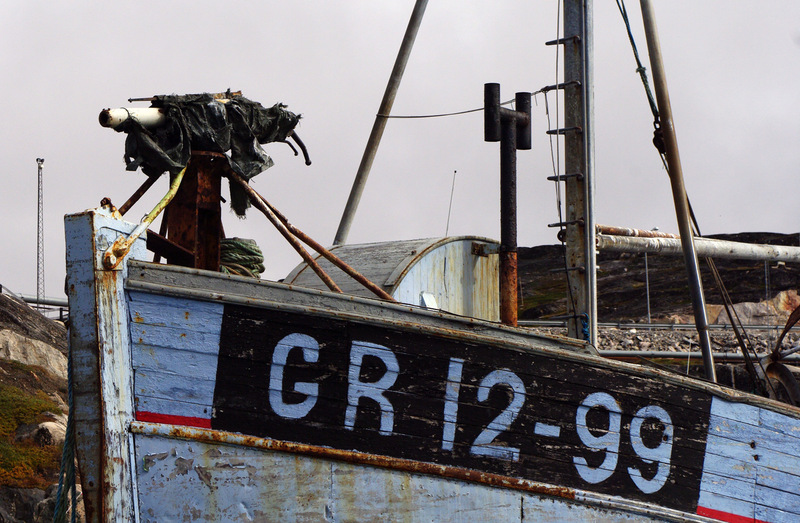 Despite its name, this kind of whaling is usually carried out with modern equipment, powered boats and explosive harpoons, sometimes supplied by the government of the country involved. 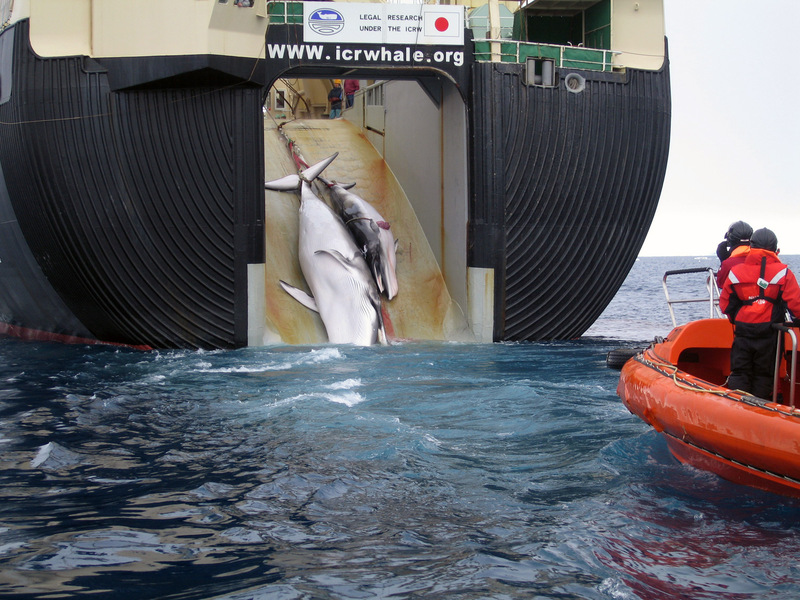 3 - Scientific whaling - Viewed by many as a controversial loophole to continue commercial whaling. Japan has issued permits for scientific whaling every year since 1986, Norway and Iceland have done the same intermittently, with 2007 being the most recent year. These figures are a snap-shot of a single year though have been similar for the last few years. Whaling catches for 2012 by country. Greenland (Denmark), Russia, Alaska (U.S.A.), St. Vincent and the Grenadines. 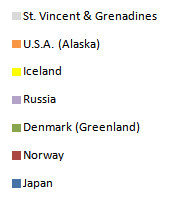 All but St. Vincent and the Grenadines are in the Arctic. 10 year trend, numbers broadly stable from year to year. Total 1,321 whales of 8 different species. Of the species of whale caught in 2012, the Sei and Fin whales are endangered species on the Red List, the Humpback and Sperm whales are "vulnerable" while the Bowhead, Bryde's, Grey and are at risk and in need of conservation measures. Cool Antarctica emailed the Japanese Whaling Association (JWA) to invite them to submit scientific data or a link to scientific data to this web site. At present no reply has been received. Transcript of email sent to webmaster@whaling.jp on Sun 27/01/02 re-sent on Sat 16/02/02. If a reply is received, it will be published here. I have a web site www.coolantarctica.com that is a general Antarctica site. I am in the process of adding a "whales and whaling" section. I have no particular axe to grind or alternative agenda, I wish to present information to an audience that consists of many schools, learners and educationalists. The section will contain basic facts and pictures about whales, historical information and present day information. Would it be possible to present some of the scientific information on my site that has been found by the Japanese whaling programme? The whaling pages are not yet in place, perhaps you would want to see them first, but they will be presented in the same manner as the pages on travel in Antarctica where I have contributions and links about pro and anti-tourism. My own position is as a concerned naturalist eager to promote Antarctica, I do not suffer from the mawkish anthropomorphism of some campaigners. If you were able to contribute anything, I would happy to submit the page that I use it in for your approval or otherwise before publishing it on my site. Oh dear - silly me! Having been a research scientist in the past, I had this idea that "scientific whaling" was about learning about whales for the purpose of advancing research and knowledge. It turns out that "scientific whaling" has really always been about monitoring the whale population to gain information about when the whaling nations can begin commercial whaling again. So the information that "scientific whaling" was looking for was when could they recommence commercial whaling - according to their own decisions of course - and look what a disaster that was first time around! It has also has the side-effect of keeping alive whaling skills amongst the fishermen and keeping the idea of whaling and consuming whales alive amongst the Japanese public to preserve the market - so it could begin again one day. This cynical use of the concept of "scientific whaling" simply reinforces the view of whalers as unfeelingly exploiting the world's whale population that should be protected forever and not "fished"
Despite this however, it seems that the whalers may be up against the strongest of all oppositions - market forces. Young Japanese in particular simply don't like the idea of eating whale meat and blubber however the whales have been killed or "culled" according to the spin of the whalers. So maybe whaling will end with the loss of a market for the whales.